Winter doldrums, be gone — with just a little love and care, your plants can thrive despite the chill. It isn’t just you — your houseplants really do look worse in winter. Blame it on dry central-heated air, shorter days, changing light patterns, and cold drafts — and the fact that some plants go nearly dormant in winter anyway, even in their own habitat. These obstacles make houseplants more vulnerable to problems like overwatering, poor drainage, and pests than ever before, but don’t let it bring you down. Instead of counting down the days until spring comes — or your plant dies on its own — follow these guidelines to keep your plants healthy all season long. Start by treating each plant as an individual. This is especially important in winter. Some plants go dormant and need drier soil, low light, and cooler air, while others still want moist soil, bright light, and warm, humid air. So do a little research. Perform a quick search on your phone or visit the bookstore or library to identify your plants and determine their needs. If you’re still unsure of their identities, follow the general guidelines below and assume they need lightly moist soil, good drainage, ventilation, humidity, and a little more attention to keep them pest- and disease-free. Before you water, make sure your pot has a drainage hole to prevent rot, and a saucer to catch excess moisture. When the top half-inch of soil is dry, water thoroughly with a watering can that has a narrow spout, which keeps you from splashing the leaves and inadvertently spreading soilborne diseases. Watering deeply promotes healthier root growth and flushes out any excess salts from your tapwater that may have accumulated over time. Winter’s dry central-heated air is uncomfortable for us, but it’s even more uncomfortable for houseplants. After all, most common indoor plants come from steamy tropical forests, so they have a hard enough time adapting to household habitats. Worse yet, dry air also leads to pest infestations, like spider mites and mealybugs. To prevent dry leaves and create a humid microclimate for your jungle-dwelling houseplants, place them on a tray of pebbles and fill the tray halfway with water, which will slowly evaporate and give the immediate area a humidity boost. Otherwise, mist the leaves twice a day or refer to the tip below. Since houseplants seem to struggle more in winter, group them together by needs to simplify your life and prolong theirs. For plants that are actively growing (most common houseplants fit this description), choose a well-lit bathroom or kitchen so they can benefit from the extra humidity created by running water. Place desert plants like cacti and succulents in a south-facing window so they can receive the maximum amount of direct sunlight. If you have subtropical bulbs or flowering plants that require a rest in winter, place them in a cool area with indirect light, and only water them when the potting mix is dry. Having a green thumb has nothing to do with luck, and everything to do with being observant. 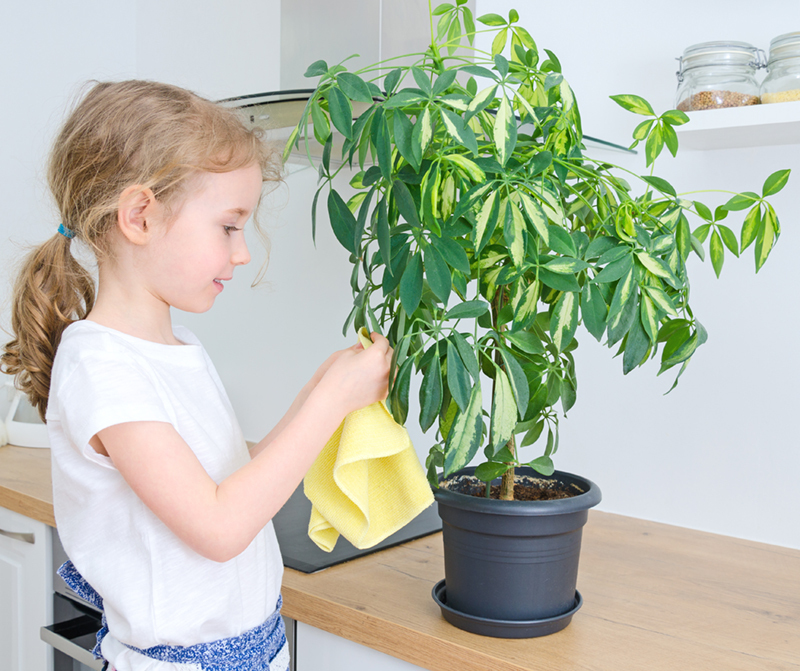 Every time you water your houseplants, look closely at the leaves, stems, and potting mix. You have nothing else to do while standing there with your watering can, so take the time to appreciate your plant’s uniquely patterned leaves, and — wait, was that a bug? Even if you couldn’t identify a mealybug if your life depended on it, you’ll discover (and remove) all sorts of things if you wipe the leaves occasionally with a damp rag and cotton swab. Houseplants are especially prone to bacterial diseases this time of year, so pay close attention to them. Remove and discard any dead leaves that appear on the plant or fall in the potting mix; they make ideal hiding places and breeding grounds for pests and diseases. To prevent stagnant air around your plants, increase ventilation with a small fan. Wash your hands and tools before and after handling them, and immediately separate or discard any diseased or infested plants so they can recover without infecting the others. If the leaves are stunted, mottled, and twisted, the plant likely has a virus and should be discarded immediately.